The gully was in tact and performing the weatherproofing functions it was designed for. It was however at a stage that maintenance was required and upgrades to the weatherproofing materials used. Sealoflex with fibres added was the chosen product and has a 10 year life, to extend its working protection it’s recommended that it’s re-applied 2 years prior to its expected retirement date. The products I choose are selected for their durability and most importantly they do the job first time and give my clients long-term value for their money invested. Weatherproofing of roofs is most important on any property to stop the ingress of weather and start the rot that occurs in places that many never see until it’s too late. 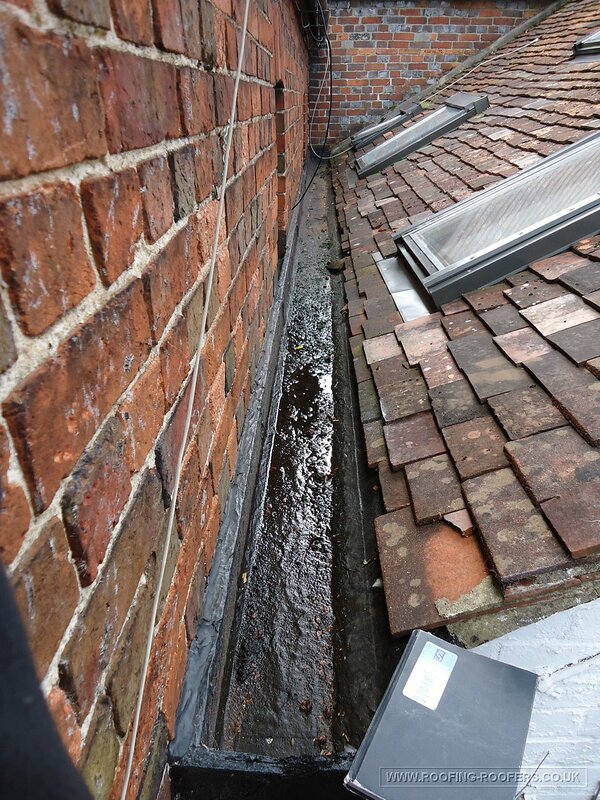 As part of the on going maintenance plans I offer all the known areas of where the rot will start or weather protections start to fail are checked periodically and especially after hard cold and wet weather. Just contact me if you would like costings on inspections that could save you large expense and disruption before it happens. This entry was posted in Roof Repairs and tagged roof repairs by admin. Bookmark the permalink.